By Laws – W4NVU – Dade Radio Club of Miami Inc.
DADE RADIO CLUB OF MIAMI, INC. In amplification of the objectives and purposes of the Dade Radio Club of Miami as stated in our Articles of Incorporation, we further dedicate ourselves to create goodwill among fellow radio amateurs everywhere, particularly in our own community; to render service whenever and wherever our particular abilities permit, not only as radio amateurs and individuals, but as members of the Dade Radio Club of Miami; to organize such events as the membership may deem proper in order to promote and encourage the best interests of amateur radio service by personal effort and exemplary conduct, both on and off the air; and we subscribe fully to the Amateur’s Code as set forth by the American Radio Relay League. E. Membership Agreement as follows: “If accepted for membership in the Dade Radio Club of Miami, I agree to abide by the Charter and ByLaws of the Association, and will actively promote, support, and participate in all meetings, programs, contest and such other activities, to the best of my ability, as a matter of personal responsibility incident to Club membership. I understand that my membership may be suspended and/or revoked for reasons of personal misconduct, violation of Federal Communications Commission regulations, or for acts which are detrimental to the amateur radio service, or to the Dade Radio Club of Miami, or for serious violation of the Club Charter and/or ByLaws. F. Signature of the applicant, witnessed by an endorsing member of the Club in good standing. A. Individual Membership shall entitle the recipient to participate fully in all activities of the general membership, subject to technical qualifications, and to hold office when duly elected or appointed. Junior Membership shall be available to individuals under 18 years of age at one-half (1/2) the individual membership dues rate and such recipient shall be accorded all privileges of an individual membership. B. Family Membership shall be available to the immediate relatives of any individual members should the wish to participate in the aims, programs and functions of the Dade Radio Club of Miami and who will subscribe to the agreement set forth for the applicants for membership. Dues, as such, shall not be required of family members; however, an assessment will be made upon the individual member under whose membership the family member participates. With the payment of One Dollar ($1.00) per year, per family member, such members of the immediate family of an individual member will be accorded privileges of individual membership. C. Honorary Membership may, by majority vote of the membership, be bestowed upon persons who have rendered outstanding and especially meritorius service to the Dade Radio Club of Miami or to the Amateur Radio Service. Honorary members shall not be required to pay dues, shall not have voting rights nor the right to hold office, either elected or appointed. If a complaint is made against a member, the President shall undertake to determine the validity of such complaint and will advise the Board of Directors of his findings. If the complaint appears to be valid and further action is indicated, the President shall notify the member in writing of the nature of the complaint and request his/her presence at a special meeting of the Board of Directors. Such meeting should be called at the earliest possible date and shall proceed informally. The member complained against shall be given every opportunity to present any and all facts relative to the situation giving rise to the complaint. When the Board of Directors has arrived at a conclusion as to the truth or validity of the complaint, the member shall be notified. The Board of Directors shall report their findings at the next regular meeting of the Dade Radio Club, except when the person complained against resigns and requests that such a report not be made. The suspension, revocation or resignation of membership should not be discussed by any officer or members of the Dade Radio Club of Miami with any person who is not a member of the Club. Dues shall be payable annually, being due December 1st of each year and being delinquent as of December 31st of each year. Dues may be pro-rated monthly for those joining the Club after January 31st of any year. The Board of Directors, sitting as the Finance Committee, shall make a recommendation to the Club as to the amount to be charged for annual dues and this figure must be approved by a majority of the membership present at a regular meeting of the club. Coffee Fund Assessment: Individual members may be assessed a small sum, not to exceed twenty-five cents ($0.25) at any meeting, for minor infractions of the Charter or ByLaws of the Club, or for any conduct which is disruptive of the proper proceedings of this Association. Such assessments may be ordered by and at the discretion of the President and all funds so assessed shall be paid into the “Coffee Fund” and shall be used to defray the expense of refreshments at any meeting. Any member so assessed may appeal to the membership present, who by a two-thirds (2/3) vote, may countermand the assessment so ordered by the President. The President of the Dade Radio Club of Miami shall supervise the official business of the Club, preside at all regular and special meetings, and at meetings of the Board of Directors, of which, ex officio, he/she shall be Chairman. The President shall also be an ex officio member of any standing or temporary committee. The Vice President shall act for and in the place of the President in every event when the President is unable to act, and shall succeed to the Presidency upon the permanent disability of the President. The Vice President, ex officio, shall be the Vice-Chairman of the Board of Directors. The Corporation Secretary shall record the minutes of all regular and special meetings of the Association; handle such correspondence as may be requested by the President; receive and record applications for membership; and be custodian of membership records and written minutes of the meetings of the Club. The Corporation Secretary, ex officio, shall be a member of the Board of Directors and shall act as Recorder therefor. The Treasurer of the Club shall be the fiscal officer of the Club, having custody of all funds, accounts, dues and other Club funds, and shall be bonded at Club expense. He/She shall keep complete, accurate and up-to-date records of all financial transactions relating to the Club and shall report on such matters to the membership at such times as may be requested by the President and/or the Board of Directors. The Treasurer, ex officio, shall be a member of the Board of Directors. The Corresponding Secretary shall handle the official correspondence for the Club, as requested by the President; be custodian of official documents, incoming correspondence and copies of outgoing mail, and other written matter as requested by the President. The Corresponding Secretary, ex officio, shall be a member of the Board of Directors and shall be Recorder therefor in the absence of the Corporation Secretary. The Board of Directors shall be comprised of the above listed officers; four other members who shall be elected to such office and the last retired President, for one year following retirement as President, should he/she opt to serve. Should such retiring President decline to serve, a replacement shall be elected by the membership. The Board of Directors shall be the steering committee of the Dade Radio Club of Miami and shall formulate policy consistent with the Charter, ByLaws and the will of the membership. An elected officer, including Director, of Dade Radio Club of Miami may be removed from such office as he/she may hold, by resignation of such officer, or for cause, by action of two-thirds (2/3) vote of the membership present at any regular meeting, provided such action is recommended by a quorum vote of the Board of Directors.Cause for removal of an officer shall be limited to malfeasance or the non-performance of the required duties of such office as the person may hold and such action by the Officer results in injury to the Dade Radio Club of Miami. A complaint regarding the misconduct of an officer shall be made to the President who shall take prompt and appropriate action to resolve the relative accuracy of such complaint. The President shall then call a designated special meeting of all the Board of Directors for the purpose of discussing his/her findings regarding such complaint. The presence of the member or members making the subject complaint shall be requested and the officer complained against shall be afforded ample opportunity to be heard. Should the Board of Directors reach the conclusion that the complaint is unfounded or insufficient to warrant removal of the officer, the officer complained against and the member making the complaint shall be so notified and the matter shall rest without further action. Shall the Club President be the officer complained against, the Vice President shall be authorized and required to perform those duties enumerated herein. A. Candidates for office in the Dade Radio Club of Miami shall be members in good standing holding any valid permanent class of amateur license issue by the Federal Communications Commission; 18 years of age; shall have been a member of the Club in good standing for at least six (6) months prior to nomination. A majority vote of the Board of Directors may waive any one of these qualifications should they deem it necessary. B. A Nominating Committee will be appointed by the President, not later than the first meeting in February of each year, to choose candidates for all elective offices, and to check on the qualifications of all candidates chosen. Nominations from the floor by any regular member will be accepted at any regular meeting during February and March and at the meeting when the election is held; these nominations being in addition to those presented by the Nominating Committee. C. Election of officers shall be by secret ballot and be held at the first regular meeting in April of each year. In the event that there is only one candidate for any office, that candidate can be elected by acclamation of the membership present, a secret ballot not being required. Officers will assume their duties upon installation at a special meeting within thirty (30) days following election. 1. The Membership Committee shall check all applications for membership and shall report to the President and membership any findings thereon. This committee may also review individual participation of each member at least once a year and make recommendations to the President and Board of Directors for any action indicated. 2. The Educational Committee shall be the steering committee for all educational programs of the Dade Radio Club of Miami and shall have the authority to analyze and act upon courses designed to meet the needs of those aspiring to obtain amateur radio licenses, educate licensees for emergency communications in time of disaster, maintain a pool of trained operators for immediate action when needed by public service agencies. This Committee shall be charged with the responsibility of reviewing changing requirements of the Federal Communications Commission of all classes of licenses, review requests of the Dade County educational system in the matter of amateur radio in the classroom instructions, as well as other entities, in order to provide up-to-date instructors and materials for all educational activities of the Club and to submit an annual budget for same to the Finance Committee. 3. The Special Events and Contest Committee shall be the steering committee for all events, functions, contests and the like that the Club wishes to participate in, and keep the general membership informed thereof. 4. The ByLaws Committee shall review the existing and proposed ByLaws of the Dade Radio Club of Miami and report thereon to the President and Membership so that they may be assured the ByLaws are best suited to the purpose, functions and aims of the Club. 5. The Technical Committee shall have authority to analyze and act upon the immediate needs of, maintenance, safety and operational integrity of the Club radio station, and shall submit an annual budget therefor for a recommendation by the Finance Committee. The Club Station Manager shall be Chairman of the Technical Committee and the station Trustee shall be a committee member. The Technical Committee shall make recommendations to the club regarding purchase of any item for the Club station. 6. The Hamboree Committee shall be comprised of a Chairman, Co-Chairman, Advertising Manager, Ticket Chairman, and Manpower Chairman. This Committee shall be responsible for planning and operating the annual Hamboree and make periodic reports to the President and general membership. Recommendations for an annual budget for the Hamboree shall be prepared by this committee and submitted to the Finance Committee for recommendation to the general membership for final action. 7. The Finance Committee shall be composed of the Board of Directors. The duties of the Finance Committee are: A. Review and make recommendations regarding all committee budgets. B. Accept and acknowledge all donations, and authorize letters of receipt to donors desiring such. C. Cause an audit annually of the Treasurer’s records and accounts. D. Require the preparation and timely submission of an annual Internal Revenue Service return. E. Review the Club Station Manager’s annual inventory. F. Review investment of the Club treasury surplus and make such changes as may be deemed desirable. G. Review the status of the Club Insurance and make such changes that are deemed necessary. 8. Temporary Committee The President shall be empowered to appoint such other committees as may be indicated for the good of the Club, i.e. Program, Advisory, etc. Regular and special meetings of the Dade Radio Club of Miami shall be held at such times and places as may be selected by the President. The President shall call at least twelve (12) regular meetings each year. Notice of regular and special meetings shall be given to the membership at least three (3) days prior to the scheduled meeting. Meetings of the Board of Directors shall be held at least once every three (3) months, beginning in January of each year, and shall be held more often if the needs of the Club require. A quorum of the Board of Directors shall consist of the President or Vice President and four other members of the Board. The meetings of the Club shall proceed informally, at the discretion of the President, so that the business of the Club may be expedited without undue restriction upon the members. Any member in good standing shall have the right to address the assembled members, to make motions, call for ballots, request and receive information relative to the business and financial activities of the Club and to recommend policy, projects and Club aims. The President and Board of Directors shall zealously uphold these rights consistent with the best interest of the Dade Radio Club of Miami and its entire membership. Twenty-five percent (25%) of the voting membership shall constitute a quorum at any regular meeting. A majority of the Board of Directors, plus ten (10) members, not members of the Board, shall constitute a quorum at any special meeting. 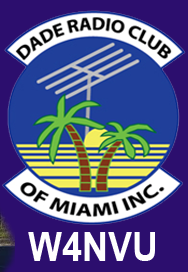 The Dade Radio Club of Miami will, when possible, maintain a properly licensed amateur radio station as a training mechanism for future amateur radio operators and an emergency communications center as needed, consisting of state-of-the-art equipment as may be provided. The Manager of the station shall be appointed by the President, with the concurrence of the Board of Directors, and shall serve as the Chairman of the Technical Committee. The duties of the Club Station Manager shall be: A. Submit an annual written inventory of the equipment in use, displayed, or stored at the radio station. This inventory shall include a specific description of all items valued at fifty dollars ($50.00) or more. Lower valued items shall be listed under a Miscellaneous category. The inventory shall show (if known or available) model number, serial number, original cost to the Club, current estimated market value, and current status, i.e., in use, on display, in storage or on loan. B. Act on disposal or purchase of equipment in concurrence with the Technical Committee. Funds obtained from such disposal shall be returned to the Club treasury. C. Implement guidelines provided by the Board of Directors for security of the Amateur Radio Station’s premises and equipment regarding possible loss or misuse, while permitting reasonable and controlled access to all authorized instructors and students and club members. A Club Bulletin, to be known by such name as the membership may select, may be published at least once monthly by an editor to be appointed by the President. The bulletin shall contain announcements of meetings, items of personal interest to the members, technical and educational information, information of a social nature, and such other material as the editor may feel in the best interest of the Club and its students. Subscription to the bulletin shall be free to all members in good standing and students registered in Club classes. The ByLaws of this Association may be altered, amended, and/or rescinded by a two-thirds (2/3) vote of the voting membership. Proposed changes shall be presented to each of the voting members in writing at a regular meeting and shall not be voted upon for at least thirty (30) days. Voting on amendments may be by means of a written mailed ballot or a written ballot conducted during the voting. Upon dissolution of this corporation, the Board of Directors shall, after paying or making provision for the payment of all the liabilities of the corporation, dispose of all the assets of the corporation exclusively for the purposes of the corporation in such manner, or to such organizations organized and operated exclusively for educational or scientific purposes as shall at the time qualify as an exempt organization or organizations under section 501 (c) (3) of the Internal Revenue Code of 19554 (or the corresponding provision of any future United States Internal Revenue Law), as the Board of Directors may determine. Any such assets not so disposed of shall be disposed of by the Circuit Court of the Eleventh Judicial Circuit of Florida, or such other appropriate court having jurisdiction in the county wherein such assets of the corporation may be then located, exclusively and for such purposes, or to such organization or organizations, as the court shall determine which are organized and operated exclusively for such purposes. THE ABOVE AND FOREGOING BY-LAWS OF DADE RADIO CLUB OF MIAMI WERE UNANIMOUSLY ADOPTED BY A JOINT MEETING OF THE BOARD OF DIRECTORS, OFFICERS AND ALL INITIAL MEMBERS OF SAID CORPORATION AND WERE ORDERED SPREAD UPON THE MINUTES OF THE CORPORATION, THIS 18TH DAY OF AUGUST, 1990.